Rose-Scented Hand and Body Lotion is a light, vanishing glycerine-based moisturizer with aloe that carries its scent for hours. Rose-Scented Liquid Soap has a silky feel and leaves skin clean without damaging sulfates, surfactants, or detergents found in many liquid soaps. 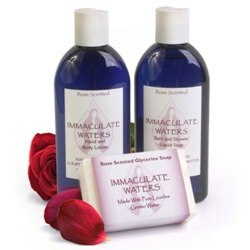 Contains glycerine, coconut and olive oil; perfect for sensitive skin. Rose-Scented Bar Soap leaves skin feeling clean and moisturized. Made with coconut, palm & safflower oils, vegetable glycerine and Shea butter. Feb 1, 2019 | By Mary M.
Hello, I love you products; thank you. Oct 21, 2017 | By Lynda Marie T.
This lotion is so light, smooth, and lightly rose fragrant. Love it. I have extremely sensitive skin and have problems with most soaps. Even soaps formulated for babies. This soap brought back the softness and youthful look to my skin. It's better all that I have tried before. Thank you so much for this amazing product! I have severe eczema and have a lot of trouble with soaps. Even soaps for babies. This one works better than even the prescription ones and smells a lot better too!